T-Bar Row Plate Post Insert designed with 8” long pivot bar sleeve & 4” long base post fitting 2” Olympic bars. 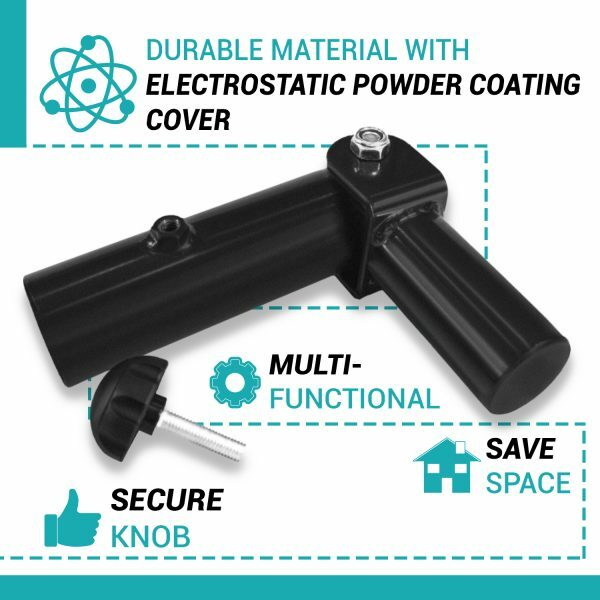 Durable T-Bar Row Insert: Thick steel pivot sleeve and solid steel base post with Electrostatic Powder Coating cover. 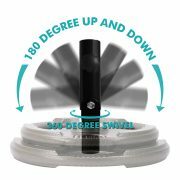 The landmine attachment has full 360-degree swivel and range swivel up and down, so it gives you multi-directional workouts that impact on all the major muscles in your back, shoulders and the pulling muscles in your arms. Multiple Exercises: Perfect for building stronger triceps with various compound pushing exercises, assisting muscles around elbows, wrists, back, and shoulders; compact and multi-function design gives you an optimum fitness space, ensure the flexibility in different exercises, perfect for both workouts at home and at the gym. Warranty: Lifetime for T-Bar Row Plate Post Insert, and 30-day free return and 1 year limited to V Handle with Rubber Handgrips. 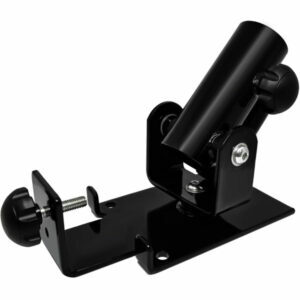 Our product is made of top-quality thick and solid steel that maintains the durability and attachment. 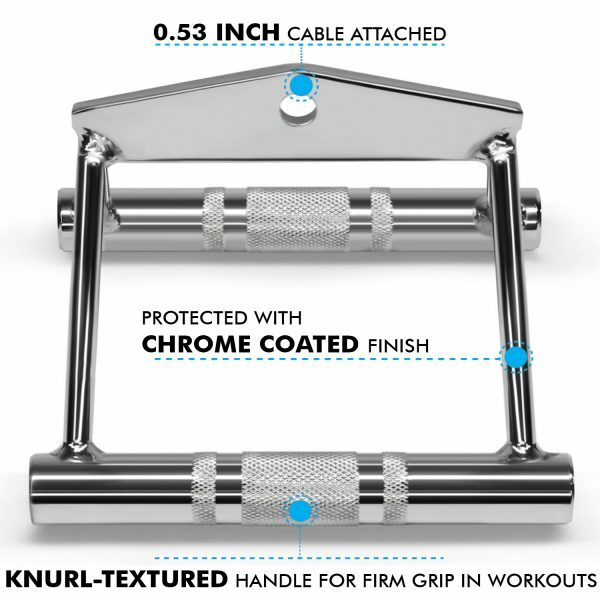 Match with 2” Olympic bars, designed with the secure knob that helps to lock bar tightly and ensure your safety during the workout. 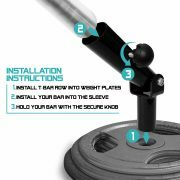 Easy to install: all you need to do is insert bar and weight plates into the sleeves and use the secure knob to tighten the bar. 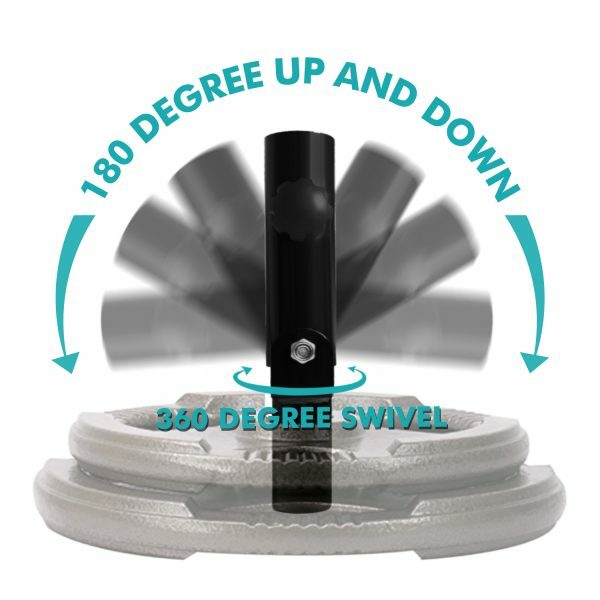 Emphasized with full 360-degree swivel and full range swivel up and down up to more than 180 degrees in width, which provides with multi-directional exercises at advanced levels. Double D Handle with Rubber Handgrips is durable and anti-corrosion & rust. 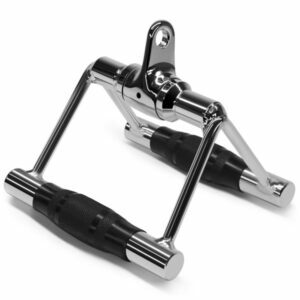 It’s constructed of high-quality solid steel with polished chrome finish. 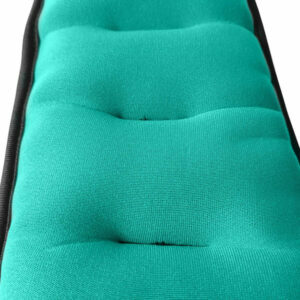 Rubber handles with non-slip textured surface increase the secured and firm grip during workouts. Work all the major muscles in your back, specifically the latissimus dorsi (lats). It is an effective means to increase your power and size of the whole back, build a solid back. 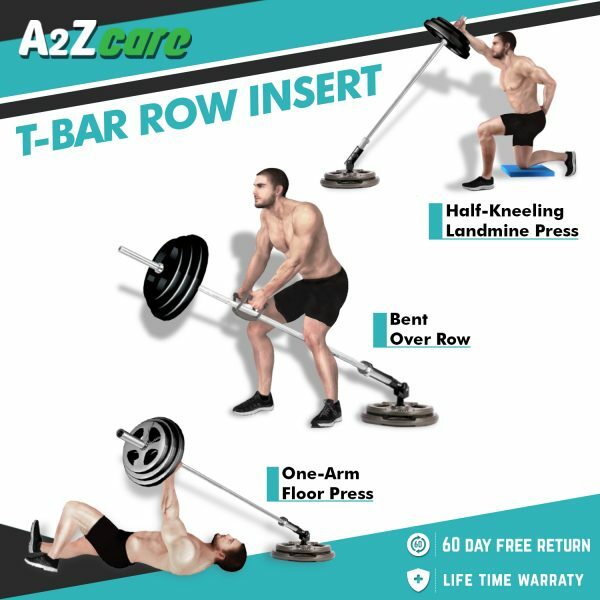 Suitable for multiple workouts: bent over row, seated row exercises, half-kneeling landmine, one-arm floor press, and more. Every exercise program is accompanied by its inherent risk. We offer products which are expectedly appropriate for experienced adults over 18 years of age. Before use, please elaborately learn how to use the product and to perform some specific exercises or to consult your physician for accurate guidance. Supplier is not responsible for any request of injury compensation or direct/indirect issues arising from using the product. This works absolutely flawlessly. 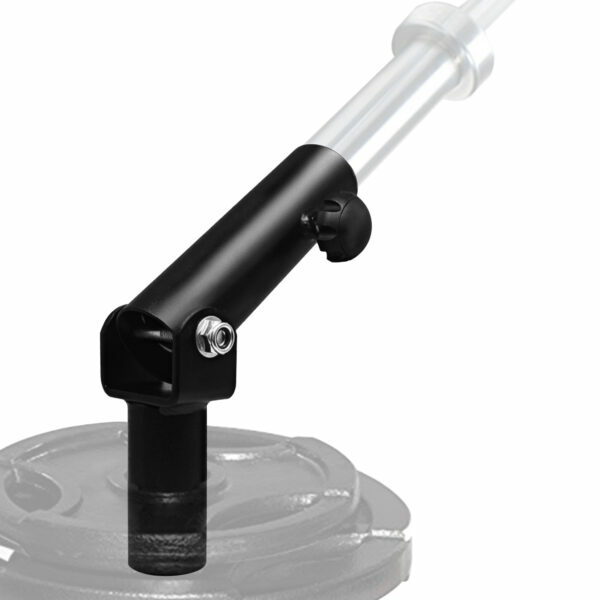 This is a great option compared to a rig-mounted LM post. Couldn’t be happier. Great piece to add to my workout equipment. It works. I like the fact that I don’t have to screw this to the floor or the wall. I use it when I want to and when I’m done I put it away. Absolutely love this piece of equipment. It’s extremely easy to use and as a personal trainer and having a home gym this adds some exercises that we can perform in a somewhat small space. 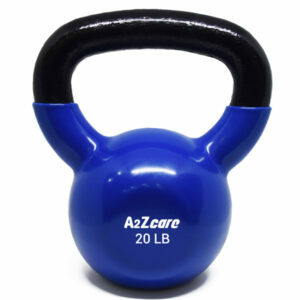 Perfect add to the home gym and a great price. Solid build and materials. Love it! Highly recommended for heavy duty use. I bought this and a landmine single eyelet. This works extremely well. 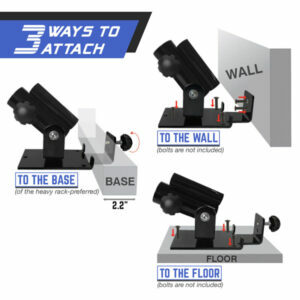 You can easily set it up by stacking two 35 lbs plates or two 45 lbs plates and sliding it into the hole. I usually only take about 2-3 mins to set everything up the way I want it. It is light weight and certainly will get the job done. Doing exercise regularly with our ankle/ wrist weight, you will gain strength and flexibility to your ankles and wrists. It comes in pair with different weights and colors: Orange – 2pcs x 1lb each, Purple – 2pcs x 1.5lbs each, Green – 2pcs x 2lbs each, Dark blue – 2pcs x 2.5lbs each, Black (red border) – 2pcs x 3lbs each, and Black – 2pcs x 5lbs for any gender or age group. 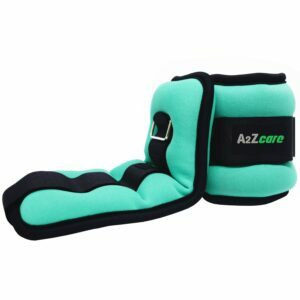 It is definitely not time-consuming to put on these ankle weights and start your exercise hours. We advise users to pick the appropriate weight to perfectly collaborate with particular exercises such as jogging, running, aerobics, gymnastics, physiotherapy… and other exercises. Our ankle weight is designed from the improved material: wrapped with elastic fabric, which is considerably soft and gives you such mild and comfortable experiences while using. In addition, there is mixed sand inside to absorb sweat rapidly. 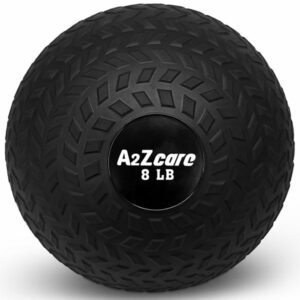 When you buy our ankle weight, you can relax with the knowledge that it comes with a comprehensive warranty policy: 30-Day Free Return and 6-Month Limited Warranty. Help you enjoy experiences with your ankle weight. HIGH-QUALITY FOR DURABILITY: Heavy-duty Polypropylene rungs and nylon straps help to prolong the agility ladder’s age for years of using and training. SUPER CONVENIENCE: The color Yellow of the rungs help highlight the speed ladders on the ground so you can not miss the steps. Already-set-up rungs make your training is always ready and easily adjust the rungs for the higher level workout. Come with a bag for carrying everywhere. WIDE RANGE OF EXERCISES: Agility ladder or sports ladder can be used in almost every agility and speed exercises to train and improve the agility, balance, lateral response and body control for a sports team such as soccer, football, basketball, baseball, hockey, and tennis. SPECIAL OFFER!!! 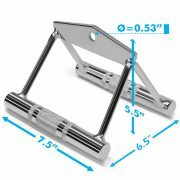 We are now selling these agility ladders in bulk (at least 12 items) to help you prepare and practice your teams as hard as international football teams in FIFA World Cup 2018. LIMITLESS USERS: Everyone can train with speed ladders from children to adults as we offer 3 types of ladders: 12, 16 and 20 rungs distance of 15 inches. NO WORRY WHEN EVERY YOUR PURCHASE COMES WITH 30-day free return and 3-year limited warranty. Dimensions: 7.5”X7.5”x5.5” (LxWxH) give you a perfect and comfortable fit to your palms when exercising, and 0.53-inch hole can fit nicely for all cable systems. 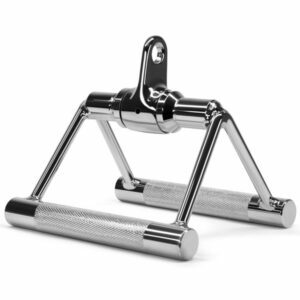 Constructed of high-quality solid steel with high, polished chrome finish, Triceps V Shaped Press Down Bar is more elegant and durable without corrosion and rust. 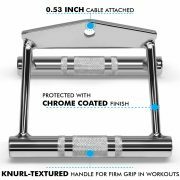 Rubber handles with the textured surface for non-slip increase the secured and firm grip to your hands during workouts; the V-shape provides a balanced force to both arms when you attach it to any gym machine to perform. 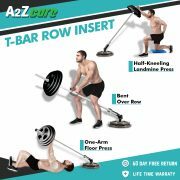 This is perfect for building stronger triceps with various compound pushing exercises, assisting muscles around elbows, wrists, back, and shoulders. Warranty: 60-day free return and 1-year limited warranty. Includes 2 bushings, with diameter 1” and 2” that can fit with any Standard and Olympic Bars respectively. Its highlight is the full 360-degree swivel and full range swivel up and down, so it gives you multi-direction workout that impact on all the major muscles in your back, shoulder and the pulling muscles in your arms. There are several holes to bolt to the floor, coming with 2 secure tighten knob: one on rear mount allows you to attach easily to Power Racks/ Wall, and one on bushings helps to tightly lock 2” Olympic Bars, which makes it extremely steady and ensures your safety during the workout. The compact and multi-function design gives you an optimum fitness space, ensure the flexibility in different exercises, perfect for both workout at home and at the gym; with our platform, only with a small space, you can totally experience back exercises effectively no matter where you are. We stand behind the quality of our products and guarantee for good: LIFETIME WARRANTY AND 60-DAY FREE RETURN. Help you enjoy experiences with your landmine. 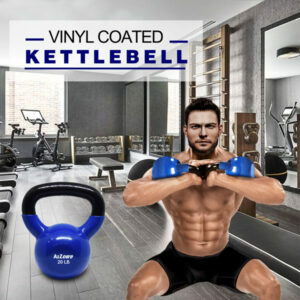 DURABLE CAST IRON WITH VINYL COATED FINISH: High-quality solid cast iron kettlebell wrapped in colored vinyl to prevent corrosion, reduce noise, increase durability, protect flooring, enhance appearance, and easy to clean. 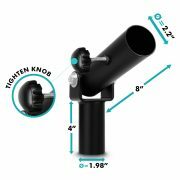 Dimensions: 7.5”L x 7.5”W x 6”H give you a perfect and comfortable fit to your palms when exercising, and 0.59-inch hole can fit nicely for all cable systems. 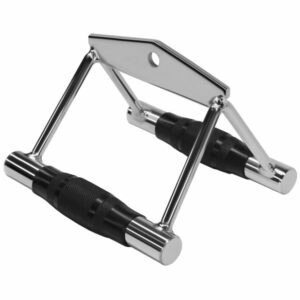 Rubber handles with the textured surface for non-slip increases the secured and firm grip to your hands during workouts; the V-shape provides a balanced force to both arms when you attach it to any gym machine to perform. Warranty: 30-day free return and 1-year limited warranty. 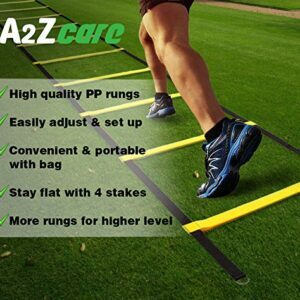 Get the latest news and offers from A2ZCare. © Copyright 2019. All Rights Reserved. Website design by MyPage.